Illinois Reading Council, which aims to promote literacy across the state of Illinois. Reading is a gift that provides endless enjoyment and sets young readers on the path to lifelong learning. In an effort to highlight the importance of reading at all ages and to support Illinois authors, my office has once again joined with the Illinois Reading Council for the annual “Illinois Reads” initiative. 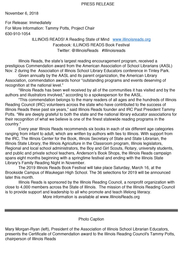 “Illinois Reads” was introduced by the Illinois Reading Council in March 2013. The initiative encourages people to read books by Illinois authors. Each year, the program offers a new list of books at six different age levels. “Illinois Reads” kicks off in March and concludes in November with “Family Reading Night,” an annual statewide event sponsored by my office. I am proud to serve as the honorary chair of the Illinois Reading Council’s “Illinois Reads” Committee. 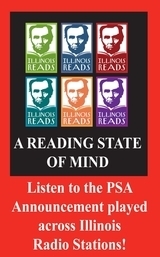 I encourage everyone to get involved by becoming an Illinois Reads Ambassador, hosting or participating in a Family Reading Night program, attending an “Illinois Reads” author event and/or reading from the rich list of titles. Thank you again for taking part in this meaningful program. 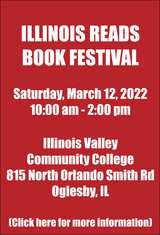 With the 2019 Illinois Reads initiative quickly approaching, the Illinois Reading Council and the Illinois Reads Honorary Chairman, Secretary of State and State Librarian Jesse White, have announced the book titles for the 2019 ILLINOIS READS initiative. Click here to read the complete press release. Illinois Reads received a Commendation Award from the American Association of School Librarians (AASL) during the Association of Illinois School Library Educators (AISLE) conference in Tinley Park. Given annually by the AASL and its parent organization, the American Library Association, commendation awards honor “outstanding programs and events deserving of recognition at the national level.” Click here to read the entire press release.